This article is about the Capra genus of animals and the Goat species. For other uses, see Capra, or Goat . Capra is a genus of mammals, the goats or wild goats, composed of up to nine species including the wild goat, the markhor and several species known as ibex. The domestic goat (Capra aegagrus hircus) is a domesticated subspecies of the wild goat (Capra aegagrus). Wild goats are animals of mountain habitats. They are very agile and hardy, able to climb on bare rock and survive on sparse vegetation. The Rocky Mountain goat is in a separate genus, Oreamnos, and is not dealt with here. All members of the Capra genus are bovids (members of the family Bovidae) and caprids (subfamily Caprinae). All these are ruminants, meaning they chew the cud, and have a four-chambered stomach which plays a vital role in digesting, regurgitating and re-digesting their food. The goats of the genus Capra have complex systematic relationships, which are still not completely resolved. Recent studies based on mitochondrial DNA suggest that the Siberian ibex and the Nubian ibex represent distinct species, which are not very closely related to the physically similar Alpine ibex. The Alpine ibex forms a group with the Spanish ibex. The West Caucasian tur appears to be more closely related to the wild goat than to the East Caucasian tur. The markhor is relatively little separated from other forms – previously it had been considered to be a separate branch of the genus.. Almost all wild goat species are allopatric (geographically separated) – the only geographical overlaps are the wild goat (Capra aegagrus) with the East Caucasian tur (Capra cylindricornis), and the markhor (Capra falconeri) with the Siberian ibex (Capra siberica). In both cases the overlapping species do not usually interbreed in the wild – however, in captivity all Capra species can interbreed, producing fertile offspring. Along with sheep, goats were among the first domesticated animals. 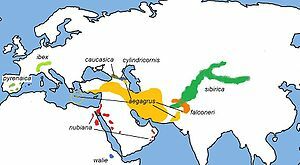 The domestication process started at least 10,000 years (calibrated calendar years) ago in what is now northern Iran . Easy human access to goat hair, meat, and milk were the primary motivations. Goat skins were popularly used until the Middle Ages for water and wine bottles when traveling and camping, and in certain regions as parchment for writing. Evidence of the ibex is widely present in the archaeological record, particularly in the Near East and Mediterranean regions. Ibex motifs are very common on cylinder seals and pottery, both painted and embossed.Excavations from Minoan Crete at Knossos , for example, have yielded specimens from about 1800 BC, including one cylinder seal depicting an ibex defending himself from a hunting dog. From the similar age a gold jewelry ibex image was found at the Akrotiri archaeological site on Santorini in present day Greece . An Iron Age Capra ibex specimen was recovered at the Aq Kupruk Archaeological site in present day Afghanistan , illustrating either domestication or hunting of the ibex by these early peoples. However, archaeological records of ibex can be difficult to separate from those of domestic goats. Rock carvings of ibex as a charm to encourage childbearing or to give thanks for a child? "Our Christian evangelist at Khalatse had become a father a few weeks before, and the people of the village had made presents of "flour-ibex" to him and his wife. He gave me one of those figures, which are made of flour and butter, and told me that it was a custom in Tibet and Ladakh, to make presents of "flour-ibex" on the occasion of the birth of a child. This is quite interesting information. I had often wondered why there were so many rock carvings of ibex at places connected with the pre-Buddhist religion of Ladakh. Now it appears probable that they are thank offerings after the birth of children. As I have tried to show in my previous article, people used to go to the pre-Buddhist places of worship, in particular, to pray to be blessed with children."